A number of players at Betsafe Casino are counting their lucky stars after a newly released slot game was paying out much faster than normal. Cosmic Fortune, a new release from Net Ent, went live at Betsafe on Wednesday. However, less than 24 hours later the game was pulled from the lobby with no explanation. As players took to the forums to find out what had occurred, it was becoming clear that Betsafe had had an issue with the slot and something was wrong with the way the game was paying out. 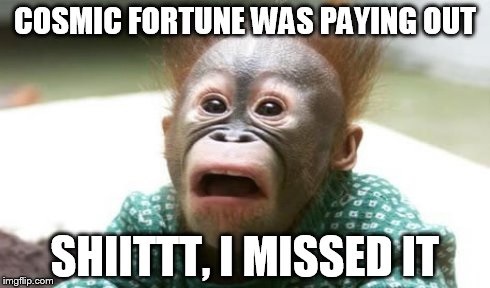 Some players were reporting that the progressive jackpots on Cosmic Fortune were being triggered ‘very quickly’. This led to some very big payouts to those who had started playing the slot when it was released. “I had a pizza, and went back to Betsafe to win some more jackpots, but it [Cosmic Fortune] was gone.” They added. “On a positive, this resulted in some players getting a bit more generous winnings than anticipated. This has now been fixed and the game should be available again at Betsafe next week,” he commented. It’s not clear exactly how much Betsafe are going to have to pay out, but it is likely to be a fairly large sum as some players picked up some of the bigger jackpot prizes. It is likely to be in the hundreds of thousands of euros after it is finally totalled up. The mixup has lead to some Meme’s being created to add a little bit of humour to the situation. 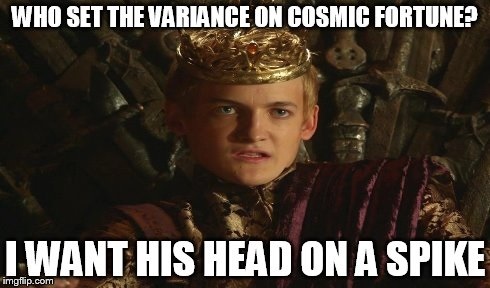 Prince Joffrey, always a popular choice. Wouldn’t be a series of meme’s without a Keep Calm poster. Even the monkey gets a look in.